The Euplectes genus will be covered in 4 visual groups: Black and red bishops (5 spp), black and yellow bishops (5 spp), blue-billed widows (2 spp), long-tailed widows (5+1 spp). 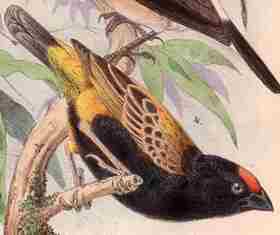 The Yellow-mantled Widowbird will also be covered in the "black and yellow" group. The Red-collared Widow is genetically closest to the bishops but is covered in the visual "long tailed" group. 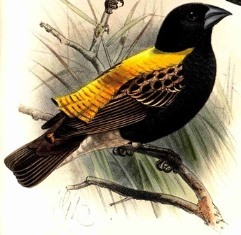 There are four bishops and a widowbird where the males in breeding plumage have black and yellow body plumage. These are all in the same genus, but are not each other's closest relatives. Other Euplectes species are black but have some yellow on the wing shoulder in some subspecies (White-winged Widow, Marsh Widowbird and Montane Marsh Widowbird). These bishops are small to medium sized weavers living mainly in moist grasslands, but also in a variety of other habitats. Their tails are of short to medium length. The bill is short and conical as the primary diet is seeds. The eyes are brown. The females are brown all year, and are smaller than the males. 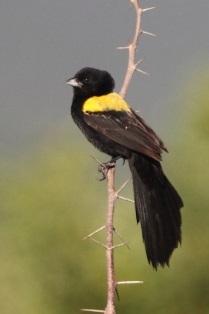 The Fire-fronted Bishop occurs in East Africa, the Golden-backed Bishop is restricted to coastal Angola, and the other 3 species occur fairly widely across Africa. These bishops are territorial and polygynous. The nest is a thin-walled oval structure of coarse grass with a side entrance, sometimes with a porch over the entrance.